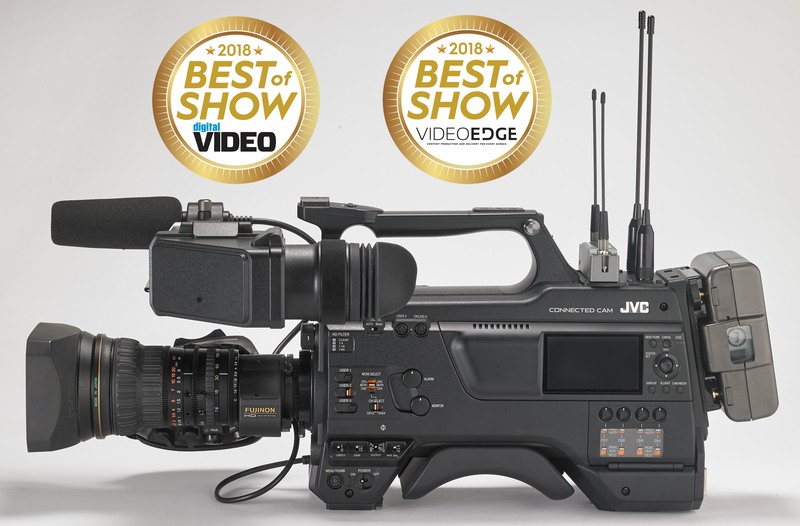 WAYNE, NJ (April 23, 2018) – JVC Professional Video, a division of JVCKENWOOD USA Corporation, today announced its GY-HC900 CONNECTED CAM broadcast camcorder received the “NewBay Best of Show Award” from Digital Video and Video Edge earlier this month at the 2018 NAB Show in Las Vegas, Nev. Now in their fifth year, the NewBay Best of Show Awards are judged by a panel of engineers and industry experts based on innovation, feature set, cost efficiency, and performance in serving the industry. Equipped with an industry standard B4 lens mount and four-position optical filter, CONNECTED CAM delivers excellent sensitivity (F12 at 60Hz, F13 at 50Hz in extended mode) and high 62dB signal-to-noise ratio (in standard mode). It also offers an HDR mode for creative flexibility, as well as up to 120fps 1080p slow-motion recording. CONNECTED CAM offers native recording of MPEG-2 at up to 35 Mbps as well as H.264 (.MOV), which provides production quality 10 bit, 1080/60p 4:2:2 footage. Other features include an OLED color viewfinder, LCD panel for menu navigation, three XLR audio inputs, 3G-SDI and HDMI outputs, and dual memory card slots for SDHC/SDXC media. CONNECTED CAM will be available in June.